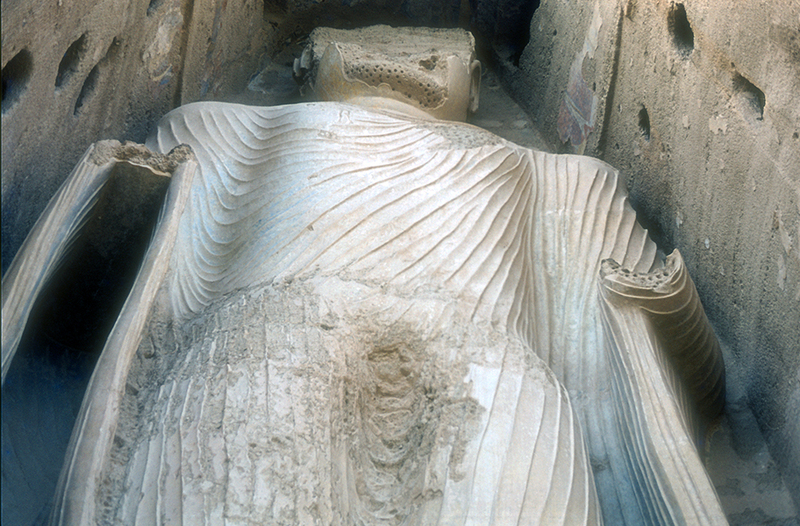 Prior to their recent destruction, the sixth-to-seventh-century, rock-cut Buddha sculptures in the Bamiyan Valley of central Afghanistan were considered the largest in the world. Known collectively as the Bamiyan Buddhas, the two monumental sculptures have amazed both Buddhist and non-Buddhist visitors for more than a 1000 years. Like many of the world’s great ancient monuments, little is known about who commissioned the Bamiyan Buddhas or the sculptors who carved them. However, their very existence points to the importance of the Buddhist faith and the Bamiyan Valley during this period. 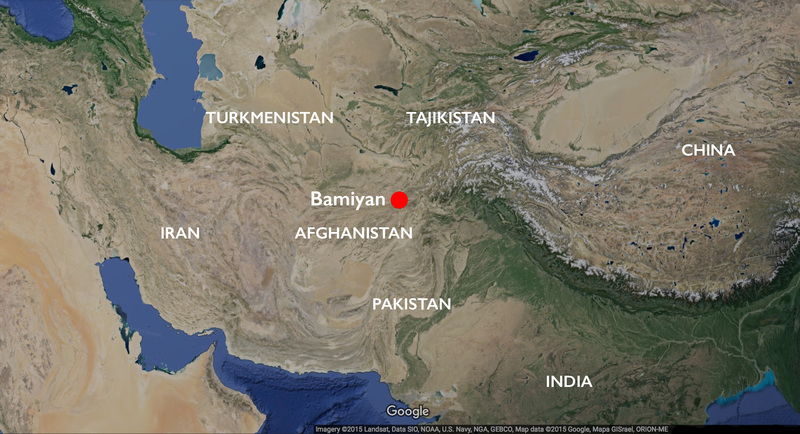 Bamiyan is located between the Indian subcontinent (to the southeast) and Central Asia (to the north), which made it an important location close to one of the most important branches of the Silk Route. The Silk Route was an ancient series of linked trade routes that connected the East to the West and carried both material wealth and ideas. 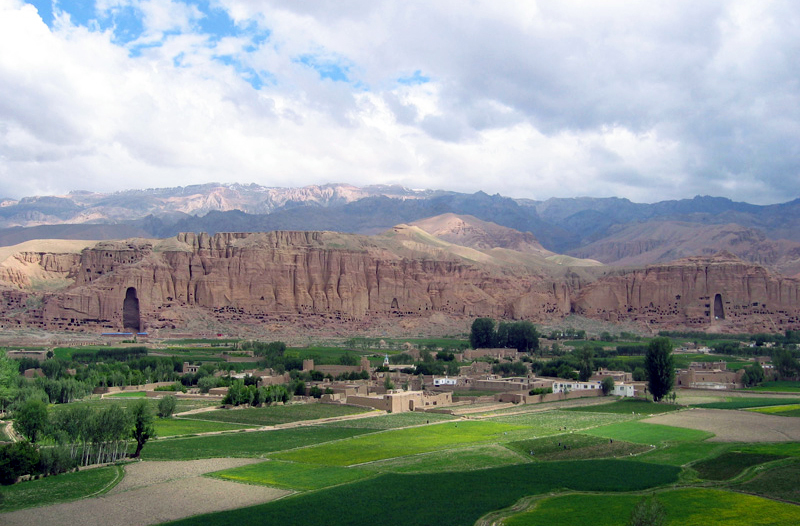 Bamiyan’s central location along the Silk Route, along with its fertile plains amid harsh terrain, made it an ideal location for merchants and missionaries to stop during their travels. Many of the missionaries and merchants in this area during the middle of the first millennium were practitioners of the Buddhist faith. Buddhism had long been an important religion in the region, having been introduced during the early Kushan period. Map showing Bamiyan and contemporary contiguous nationsBuddhism spread, in part, because it was not location specific. Believers did not need to worship at a particular temple or at a particular site as part of their practice. Worship could take place anywhere and at anytime. This freedom resulted in the emergence of Buddhist cave architecture throughout Asia. Indeed, if one visits Bamiyan today, one will see nearly 1000 Buddhist caves carved along 1300 meters of cliff face.1 It is against this backdrop of carved caves that the two monumental Buddha images were carved. Prior to their destruction in 2001, two monumental Buddha sculptures could be seen carved into the cliff facing the Bamiyan Valley. The larger of the two figures, located on the western end (on the right in the photo above), measured 175 feet in height. The art historian Susan Huntington has argued that it represented the Buddha Vairochana. The smaller of the two monumental statues, located to the east, depicted the Buddha Shakyamuni. This figure was also enormous and measured 120 feet in height. Both images were carved into niches of the cliff side in high relief. The area near the heads of both Buddha figures and the area around the larger Buddha’s feet were carved in the round, allowing worshippers to circumambulate. Circumambulation, which is the act of walking around an object such as a stupa (a reliquary mound) or an image of the Buddha, is a common practice in Buddhist worship. Xuanzang’s descriptions of the Buddhas provide us great insight into not only what they might have looked like in the seventh century but also how they were engaged with the community around them. Perhaps most surprising to our modern experience with Buddha imagery is that the monumental rock-cut sculptures are described by Xuanzang as being adorned with metal, color, and gems—not stripped down as we often see them in museums and galleries. While there is debate over the material and treatment of the Buddha’s faces, we know that pigments were applied to the stucco that covered the stone surfaces of the sculptures. Stucco helped to even out the textured rock surface. One can imagine what a powerful impression these monumental Buddhas would have made on passersby and worshippers. 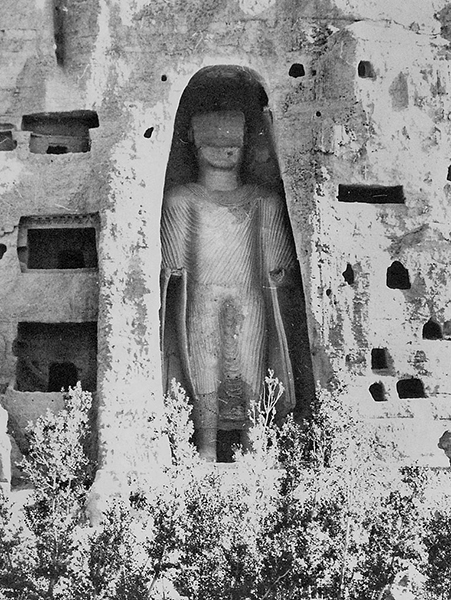 In 2001, Mullah Omar ordered Taliban forces to demolish the Bamiyan Buddhas. As reported in The Guardian, the destruction took several weeks, and the two figures “proved remarkably solid. Anti-aircraft guns had little effect, so the engineers placed anti-tank mines between their feet, then bored holes into their heads and packed them with dynamite.” Only outlines of the figures and a few details now remain in place; fragments of them (including about 30% of the smaller Buddha) are piled nearby. The Taliban’s direction to destroy the Buddha images was motivated, in part, by the group’s extreme iconoclastic campaign as well as their disdain for the fact that money from western countries was being spent on protecting the images while there was an intense and growing need for humanitarian aid in the region. It was also unquestionably an act designed to gain global media attention, as video and photographs of the destruction circulated quickly and were seen all over the world. Bamiyan is now listed by UNESCO as a World Heritage Site in Danger, and debates over how to restore the site connect to both national and international issues around what constitutes proper preservation, interpretation, and remembrance at former sites of violence. The questions that must now be answered about Bamiyan are: how do we preserve what is left at the site from further destruction or deterioration? How do we do so in a way that takes into account the needs and desires of the local, national, and international communities for whom this site holds meaning? And how do we properly memorialize the tragedy of the Buddhas’ recent destruction? The Taliban’s claim that destroying the Buddha sculptures was an Islamic act is belied by the fact that Bamiyan had become predominantly Muslim by the tenth century and that the sculptures had up until 2001 remained a largely intact. Distinct, non-Buddhist local traditions had grown up around the two sculptures, with a legend characterizing them as doomed lovers who had pledged to live out their commitment to one another by standing together in stone for eternity. 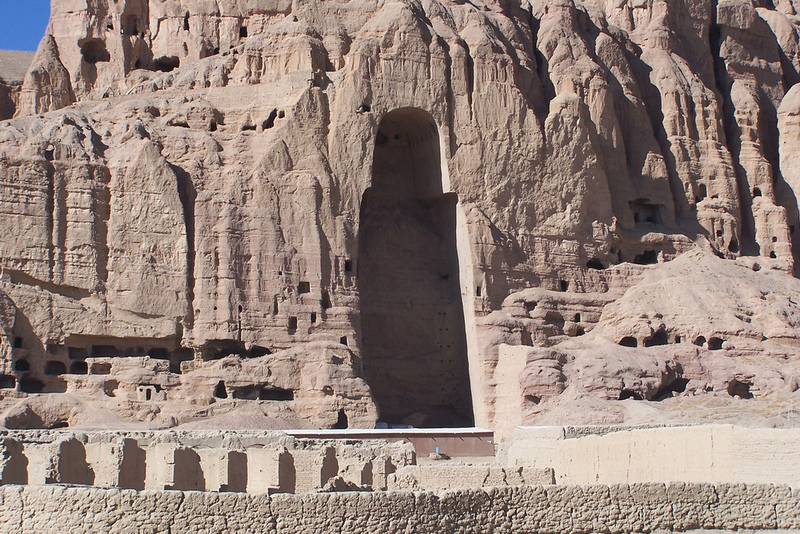 “Local people had completely forgotten they were figures of the Buddha,” said the head of historical monuments in Bamiyan province. Recently, however, the government of Afghanistan has requested that the reconstruction of the smaller statue be undertaken, citing, among other reasons, the dire need for tourist income to Bamiyan. The Bamiyan area, one of the poorest in Afghanistan, is home to a distinct ethnic group, the Hazara, who resisted Taliban influence and have also long resented what they see as discrimination by the country’s leaders in Kabul. However, how to reconstruct the Buddha figure is still the subject of debate. A UNESCO meeting of international experts in 2017 concluded that “any consideration of recovery and reconstruction should be based on thorough multi-disciplinary research and scientific analysis, to ensure an understanding of the structural, material and other characteristics of the damaged heritage property”—in other words, ample funding and time are needed in order to ensure that the work takes place in proper and ethical ways. The destruction of the Bamiyan Buddhas was a huge loss for our understanding of human history. However, even in darkness light has a way of emerging. Since their destruction, several new discoveries have been made near the sites of the Bamiyan Buddhas including the discovery of fragments of a 62-foot long reclining Buddha, as well as several caves with murals that may be the world’s earliest examples of oil paint. 1. Takayasu Higuchi and Gina Barnes, “Bamiyan: Buddhist Cave Temples in Afghanistan,” World Archaeology vol. 27., no. 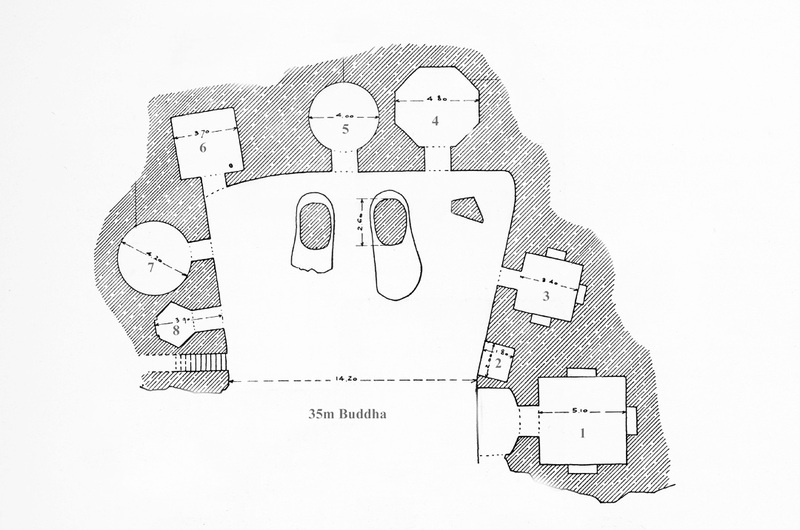 2., Buddhist Archaeology (Oct., 1995), pp. 282-302. 2. Llewelyn Morgan, Buddhas of Bamiyan: Wonders of the World (Cambridge, MA: Harvard University Press, 2012), p. 7. 3. Xuanzang, The Great Tang Dynasty Record of the Western Regions, translated Li Rongxi (Berkeley, CA: Numata Center for Buddhist Translation and Research, 1996), p. 38. 4. Deborah Klimburg-Salter, The Kingdom of Bamiyan: Buddhist Art and Culture of the Hindu Kush (Naples and Rome: Instituto Universitario Orientale and Instituto Italiano per il Medio ed Estremo Oriente, 1989), 87-92. 5. Finbarr Barry Flood, “Between Cult and Culture: Bamiyan, Islamic Iconoclasm, and the Museum,” Art Bulletin, vol. LXXXIV, Number 4 (December 2002), p. 648. Cite this page as: Dr. Melody Rod-ari, "Bamiyan Buddhas," in Smarthistory, November 21, 2015, accessed April 19, 2019, https://smarthistory.org/bamiyan-buddhas/.